From an era THAT IS GONE FOREVER… ALMOST. 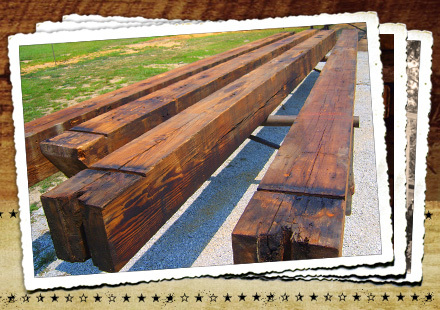 It’s a real enjoyment for our team here at Vintage Flooring & Furniture to harvest antique wood from old buildings throughout America. We truly believe we are helping our environment and at the same time making sure at least something wonderful remains as a reminder of the passing years. A time when men with a mind and will to work with their hands, ropes and mules would put in a 10 hour day and gratefully received a just days pay of $3.00. Men with character as strong as the buildings they were building. 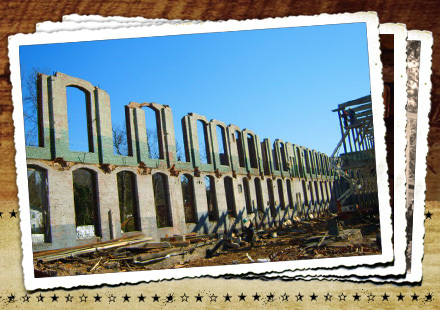 Every nail hole in our antique lumber is a testimony to that. Some of the nails our men pull are nine inches long, and they were driven into wood with growth rings so tight you can’t count them, and remember there were no nail guns a hundred years ago! Our business is about as re-cycling as you can get. Every year thousands upon thousands of trees are cut from our forests, trees that took years to grow and provide the oxygen we breathe. 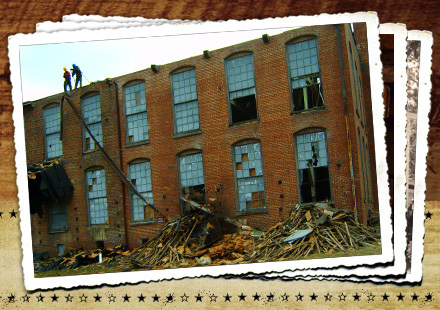 Every time we turn out a floor or gorgeous piece of furniture, we know that many trees were spared. That’s a great feeling. 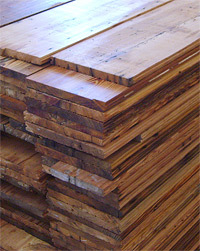 Much of the wood we reclaim is not even available today, such as the Southern Longleaf Yellow Pine that produces the Heart Pine included in our products and American Chestnut. Come on in, we think you too will catch the excitement with us in bringing back some of the HISTORICAL ROMANCE in AMERICAN HISTORY.